On August 10th, 1628, the Vasa claimed her place in the history books by sinking on her maiden voyage. Today, the Vasa rests in a musuem where she can engage and excite curious and enquiring minds. With more than 1.3 million visitors a year, the Vasa Museum is Scandinavia’s most visited museum, and is ranked at #9 of the World’s Top Museums on TripAdvisor. 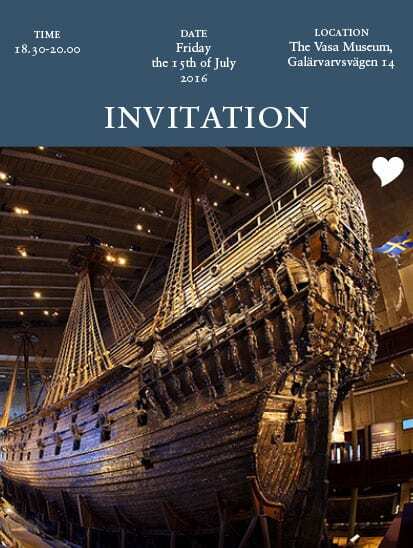 TBEX Europe 2016 attendees will have the opportunity to see and learn more about the Vasa at our exclusive evening party on Friday, July 15th, 2016, from 6:30-8 p.m. While sipping sparkling wine and enjoying some light snacks, you can travel back to 1628 as you walk around the mighty warship Vasa. The evening will also feature special musical entertainment. If you’d like to extend your time at the Vasa, you can opt to enjoy a no host dinner (hours are 7:30-9 p.m.) in the Vasa Museum’s Restaurant, featuring Swedish cuisine, candlelit tables, and beautiful water views. Reservations required if you want to stay on for dinner. Awesome – what a great idea. So looking for to it. A big thank you to Vasa Museum and the Tourism Promotions Board of the Philippines for hosting the drinks. Will jump in an make a reservation. I’m also very much looking forward to this party. If I could make a suggestion. Wouldn’t it be great if we could somehow connect with other bloggers that may want to stay for dinner, but don’t want to dine alone. I would like to eat at the Vasa Museum’s restaurant after the event, but wouldn’t really want to do it by myself. I would love to share the table with another travel blogger or bloggers. What a great party this was! Thanks for having us!